Through art, architecture, and “symbolic landscapes,” post-conflict Northern Ireland is changing the “face” it shows the world. 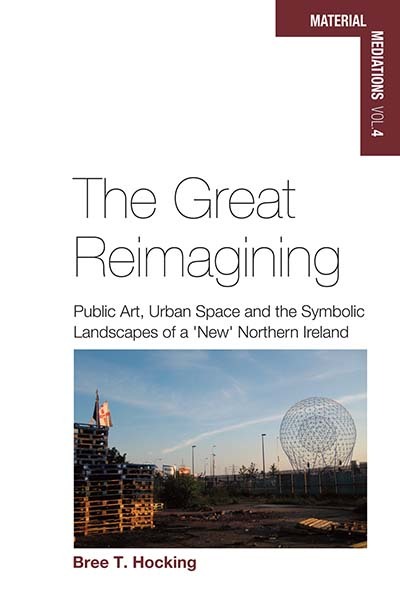 Bree T. Hocking explores this new identity in The Great Reimagining: Public Art, Urban Space, and the Symbolic Landscapes of a ‘New’ Northern Ireland. In the following short essay, the author explains some of actual and perceived changes, by way of the words exchanged with a young Protestant man. But since the 1998 Good Friday Agreement, which brought an end to three decades of violent conflict between Catholic nationalists who historically have favoured a united Ireland, and Protestant loyalists who want to remain part of the United Kingdom, Northern Ireland has on some levels witnessed a remarkable rebirth. Belfast, the provincial capital, now sports gleaming multi-storey shopping centres and hip art galleries. Upscale bistros, bars and cafes dot a city centre that at the turn of the twenty-first century was still mostly defined by fear and provincialism. That said there’s a pervasive sense among the working class—who for the most part bore the brunt of the Troubles and to some degree remain under the influence of various paramilitary groupings—that the so-called peace dividend has not benefited all stratas of society equally, nor, for the most part, has the promised social reconciliation transpired. Punishment shootings, bomb threats, residential and educational segregation, and, as I explore in “The Great Reimagining,” ongoing struggles over control of the symbolic landscape—including such aspects as parades, flags and public art—are a reality of everyday life in Northern Ireland. Indeed, for many residents, the cosmopolitan-style redevelopment ushered in by post-conflict reconstruction, and funded with substantial European Union peace monies, has added another layer of segregation to their lives with large swaths of the city now “reimagined” for an affluent tourist class. Public art intended to contribute to shared cultural spaces has just as often led to the opposite, resulting in a profound disconnect with the “community” it ostensibly represents. The same could be said for many of the new cultural venues that have emerged on the urban landscape in recent years, most prominently the Titanic Belfast “visitor attraction,” which tells the history of the city and its famously doomed White Star ocean liner, and has become a popular stopping point for cruise ship passengers. Tellingly, the man I spoke to also noted: “I live in Belfast, and I’ve never been [to Titanic Belfast]. 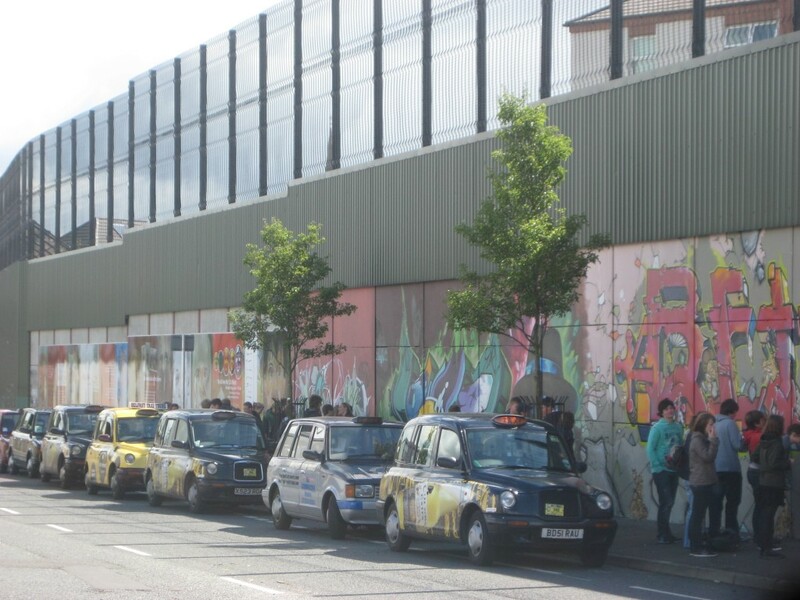 … It’s geared far more to tourists and people coming in than for the likes of somebody living here” on the Shankill Road. Thus while the delights of upscale tasting menus and contemporary art are trumpeted in the New York Times’ 36 Hours column as proof positive of Northern Ireland’s renaissance, the working class and its culture is often marginalized in this “new story”—apart from its usefulness in providing such touristic diversions as “Taxis and Troubles,” attraction No. 6 on the Gray Lady’s whirlwind itinerary. Such touristic offerings effectively cast the local in the all-too-common and essentializing role of conflict re-enactor. Some might argue that it’s a living, but clearly one without much of a future. And as my research has explored, while the performance of reconciliation continues on an official level, a closer examination of the processes required to put this image in place reveals a sometimes critical disconnect with reality. 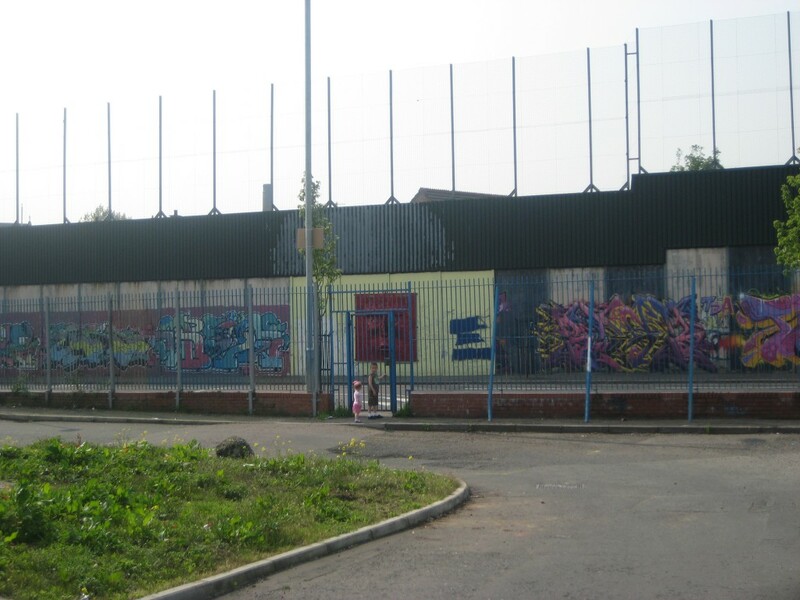 Case in point: The peace wall where I met the young man has been the subject of extensive public art enhancements justified in part on their potential to de-sensitize the area and contribute to a shared society. But the gates are still locked at night for security reasons, and the only people that seem to share the space much are the tourists who flock there in black hackney cabs to sign their names.